Oh to enter reality like a boat does the night! Throughout Surge, Etel Adnan gets at reality by melting into the world around her, she lets herself be subsumed by nature, welcomes mountains and waves to reverberate through her in order to better understand herself and the present moment. “The sea is an element of our inner life, a tool by which we exist” Adnan once said in an interview. Nature is not a thing to be looked at, but something through which we live. So mountains are languages and languages are mountains. We are simultaneously the makers of reality and unable to reach it. It’s flowing from inside of us and yet we don’t know how to inhabit it, how to let it inhabit us. Cycles and surges, multiplyings or collapsings, perhaps both at once. Further away light eating at light annihilating itself in greater intensity, entering the infinite. Author of more than a dozen books in English, French, and Arabic, Etel Adnan is often described as a poet-philosopher because of how she thinks through the world around her through her books, seemingly getting closer and closer to the core of the world with each work, hacking away at that hazy border between us and the world around us. It’s as though we are watching Adnan be absorbed by the outside, watching the world be absorbed into Adnan. The idea of a poet-philosopher might seem redundant. Poetry is read and written to dismantle the world, to put dents in our language, to rethink it all. But the description couldn’t be more apt when it comes to Adnan’s work. Adnan’s philosophy is an entangling of poetics and creation with a penetrating consideration of the real. It’s a dismantling of nature, of time, of memory, of everyday occurrences, to inch closer to reality. Through her poetry, chasms are opened. Her philosophical inquiries follow no logic or rule. Questions are asked, worlds are inhabited, realities are exploded, no answers are given. Surge shines glimpses onto a world that is seen, felt, thought, and imagined all at once, assembled as it is shattered. 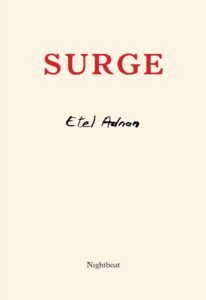 Nothing in Surge resembles the world we think we know, and yet we immediately recognize the world Adnan has created. Its disorder is its truth.
. . . or the way to distant galaxies. The animals feels that disorientation. Thoughts are metallic and melt in salt water. Reading Adnan’s words feels as though we are privy to the little mutterings she lets out under her breath as she goes about her day, small thoughts that come to her as she looks out her window or stares out at the ocean. Each thought, fed onto the page as a tiny prose poem, reads so delicately that we marvel as much at the beauty of her thoughts as at the beauty of her language. Only to find at the end that Adnan has unraveled our way of being, and the next time we look to a mountain, or the sea, or the sky, we will suddenly feel the surge of chaos and possibility where once we thought there was mere tranquility. A world forever expanding and us along with it. By looking out at the universe, we are looking into ourselves. By naming that shimmering, we are piecing ourselves together. Adnan has given us a new way of thinking through ourselves and the world, our place in the universe. Another layer of identity—we are the world, formed by it, wrung through with it, saturated with it, reflected in it, heard by it as we listen to it. She invites us to ask what it means to be able to look out onto the ocean, over mountains. What it means to coexist with and exist through nature. We are shaped by feeling the surge of the ocean, by listening to the reverberating of the real in it. Adnan has found a new way of getting at reality: through her poetry, she melts into her “twin,” the world. Emma Ramadan is a literary translator based in Providence, RI, where she is the co-owner of Riffraff, a bookstore and bar. Her translations include Anne Garréta’s Sphinx and Not One Day (Deep Vellum), Anne Parian’s Monospace (La Presse), and Fouad Laroui’s The Curious Case of Dassoukine’s Trousers. Her forthcoming translations include Ahmed Bouanani’s The Shutters (New Directions), Brice Matthieussent’s Revenge of the Translator (Deep Vellum), and Virginie Despentes’s Pretty Things (Feminist Press), among others.